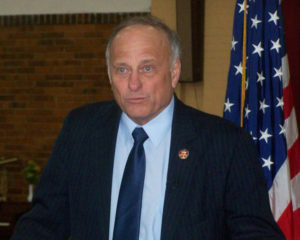 Republican Congressman Steve King says he’ll support President Trump if the president follows through on his threat to close the southern border. “But I think it was more a message than it was a policy,” King told reporters in Le Mars on Saturday. King believes Trump’s threat was meant to pressure Mexico to seal its southern border with Guatemala. “You’re starting to hear that there’s a little more help from the Mexicans on the migration coming out of Central America,” King said. While King has signaled his support for sealing the U.S. border with Mexico, he said there must be conditions to allow trucks through, so commerce can continue. “That freight might come through a little faster if you don’t have all those vehicles coming through the border,” King said. About 20 people gathered outside King’s town hall in Le Mars for a protest organized by local Democrats. A few Republicans have stepped forward to say they’ll run against King in the 2020 GOP Primary in Iowa’s fourth congressional district. State Senator Randy Feenstra, a Republican from Hull, announced last week that he had raised more than a quarter of a million dollars for his campaign against King.